In April 2004, Caprice, a C&C 43 number 3 in production, arrived in Bronte from Chicago. At the beginning its arrival was nothing out of the ordinary. It had been received with piqued curiosity though as the boat in our eyes is part of an era that produced many great boats which is a view shared by its owner and is partly what fueled an evolution that few boats and their owners will experience. It was contemplated at the time that upon the boats arrival it would just be cleaned up and launched to be used. But after 3 years and the essential completion of the project, it was anything but a quick clean up. The boat now clearly resembles nothing of its former self and for that matter is not, outside of the overall design/lines which was much to do with the inspiration for this project. 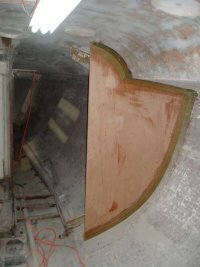 The only things that are original are the basic deck, hull (both refinished) toe rail and the forward ring bulkhead. Otherwise the boat is entirely new. To compile a complete list would be exhausting but in its class it provides just about anything someone could want or could imagine. And after having become acquainted with the owner and his predilections it is a manifestation of his insistence on being complete and the best and something to be admired. He knows not what half assed means. 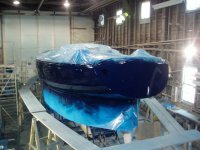 And not only is the boat very complete and nearly if not perfect, it is unique and possibly some may think as we do innovative as any custom boat should hope to be. Examples include its nav station design with overhead console or its head with custom shower design and mahogany counter and custom fibreglass sink. 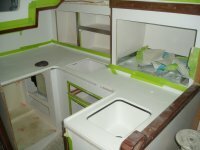 The boats attention to detail speaks of truly custom and personal but can surely be appreciated by many boating enthusiasts. However the boat is viewed by others, I do know to Jim and myself it was truly a project of a lifetime and we have been fundamentally spoiled having been brought such an opportunity. It is truly the flagship production of our company and that designation will likely withstand the test of any future propositions for many years to come I am sure. There really is not much more to a boat we could do…but we would enjoy trying. Copyright © 2012 - 2003 Northshore Boatworks - Oakville boat repairs All rights reserved.